This post is in partnership with Frontier Co-op. All views are my own. How many of my recipes have the name "cheesy" in the title? Is anyone counting? I certainly hope not... or hope so? Place shredded zucchini and ½ teaspoon salt in a large mixing bowl. Allow to sit 10 minutes. Place zucchini in a large kitchen towel, wrap it up and twist, and squeeze water into the sink. Once zucchini is mostly dry, place it back into the mixing bowl. Stir in remaining ¼ teaspoon salt, eggs, breadcrumbs, nutritional yeast flakes and herbs and spices until thoroughly combined. Heat oil in a large cast iron skillet or nonstick skillet to medium-high heat. 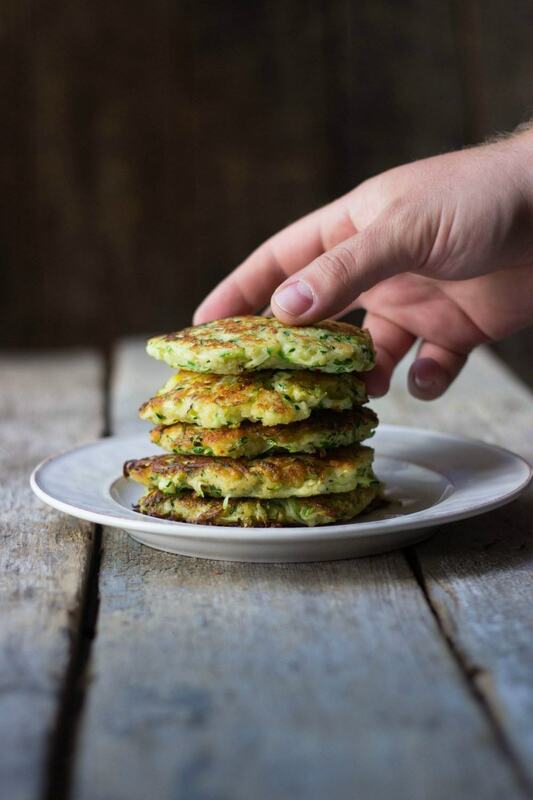 Form zucchini mixture into a patty and place in the hot oil. Cook 2-3 minutes on each side, until each side is browned and crispy. Repeat with remaining zucchini mixture. Serve with spicy mayo (4 Tbsp. mayo + 2 tsp. Sriracha).